Your love for Mazda3 is about to get increased by a huge margin. This is because you are going to appreciate how this modern vehicle has still been able to maintain some of the design options that were more commonly associated with older models. 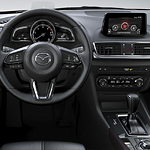 You still have the choice to get the Mazda3 5-door vehicle in either an automatic or manual transmission. You can also customize some other things about it that can make it truly your own. Drivers have long said that they love the Mazda3 hatchback, but it only continues to get better. This latest model boasts of a 37 miles per gallon fuel efficiency standard. That is great, but it is made even better when you realize that this all comes in a package that is second to none in terms of true power. You are giving up nothing and are going to look great behind the wheel of your Mazda3.